Ignitor made his first appearance in Skylanders: Spyro’s Adventure. He is extremely gifted with the element of fire. He is a fire spirit knight, though he was not always this way! Before gaining his fiery powers, he was nothing more than new knight, off on his first quest to fight a dragon, lacking experience and a strong defense. He was using some shabby old armor and a rusted sword. On his way to the dragon, he met a witch who offered him some armor that was resistant to fire. That sure would come in handy, so he accepted the offer. After he reached the dragon, though, getting blasted by fire, he had a drastic transformation. The armor was actually created from cursed steel! It bonded to Ignitor, trapping him in for all eternity, blazing with flames. It sure must have been a scary event, but Ignitor tries to keep a good attitude. He was not a very powerful knight before, but now he has the strength of fire on his side! 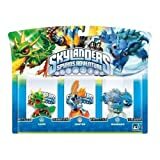 He can use his situation to his advantage by calling upon his powers to protect and defend all of the creatures in Skylands. There is also a Series 2 Ignitor Figure. The character also comes in a 3-Pack with Warnado and Camo.